Pigeons build relatively flimsy nests from sticks and other debris and prefer to nest on structures such as homes and buildings in Las Vegas, North Las Vegas, Henderson, and Boulder City, NV. The male pigeon collects nesting materials and the female makes a nest out of them. Female pigeons lay 1 or 2 eggs. The pigeon offspring will leave the nest after 1-4 weeks. Pigeons prefer to stay at the home they are born at and will do just about anything to stay there or if they are forced out they will attempt to return at all costs. Pigeons do not remove their waste from their nests and as a result, the nests become heavier and more solid with time and can become a health risk to humans. Pigeons are considered a pest in Las Vegas not only because they prefer to nest on structures occupied by humans but they may spread diseases to humans. 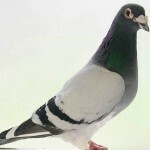 Pigeons breed all year long and can transmit the bird flu or avian flu. Some diseases that are thought to be caused by pigeon droppings are histoplasmosis, cryptococcosis, and psittacosis. Pigeons can transmit diseases when humans come into contact by cleaning up pigeon droppings. We at Agent Pest Control have disinfectants that we may use to aid in the prevention of these diseases. We will screen off the areas of the house or structure if the pigeons are nesting and have become a pest problem as well as add a repellent gel. This will prevent the pigeons from nesting any further on the structure and the pigeons will fly away and go to another structure in Las Vegas, North Las Vegas, Henderson, or Boulder City, NV to nest. Pigeons will roost on a house if one of their nests is nearby. Roosting pigeons keep an eye out for predators and will sit on the edge of a roof. They will also fly away and roost elsewhere once their nesting area is screened off. Spikes may also be used to prevent pigeons from roosting on the edges of the house. It is important to remove all pet food from outside as this will draw pigeons to the property. Sometimes poisoning pigeons is the only viable option for control. We have legal methods of poisoning and have a success rate of 80% or higher. Complete 100% pigeon control by poisoning is not very common because pigeons will see other pigeons acting strangely after they have ingested the poison and will become shy themselves of the poison. PEST CONTROLPigeons create a myriad of health and safety issues. Thier droppings carry disease and can cause property damage if not properly controlled.